If you pull water from a lake or canal for your South Florida irrigation system, get ready for algae. Usually, the algae starts to grow in the spring like the plant material and the turf grass. This is normal. However, this year the lakes are a little lower than normal, meaning there is less water in them. The interesting part is that there is going to be the same amount of algae growth, but less water. In other words, there will be a higher concentration of algae in the water. What does this mean for your irrigation system in South Florida? 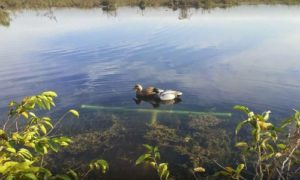 Well, if you pull water from a lake or canal, you will have algae start to grow inside your filters and pipes, which will be sucked up into your South Florida irrigation system, causing clogged heads and such. As always, if you need assistance with your South Florida lake feed lawn sprinkler repairs irrigation system, give us a call at Above All Sprinklers a call at 954-588-9988 or use the form found on this page.